Austria may be known as the classical music capital of the world, but make no mistake, Cornerstone are here to rock. The band, comprised of Patricia Hillinger (vocals), Michael Wachelhofer (bass, keyboards & vocals), Steve Wachelhofer (guitar & vocals) and Mike Pawlowitsch (drums & percussions) signed to the US based label ATOM Records in 2008 and that same year released their debut album "Head Over Heels". After the CD release, the band did numerous tours of Europe and America. 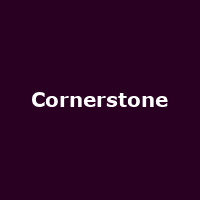 Cornerstone were able to do a mixture of headlining club shows and sharing larger stages with acts such as John Waite (The Babys, Bad English), Iron Maiden's Dennis Stratton, New Model Army and American singer/songwriter Jeffrey Gaines, just to name a few. Some of the songs from "Head Over Heels" were included in the motion-picture soundtrack for the film "Little Alien", which was shown in cinema and on television. Cornerstone won the "Next Big Thing Contest", hosted by Alternative Addiction, in March 2008 and had a No. 1 hit on Chungaradio Statesides. In 2011 the song "Right or Wrong" was awarded as "Ballad of the Year" by British Rock Realms Magazine.